Testing is a process to expose hidden defects. It is detecting errors and deviations from specification. It is verifying that a system satisfies its specified requirements or not. Here discuss principles of testing. Exhaustive input testing means test all possible input condition as test cases. Test for all valid and invalid input conditions. But it is impossible to test a system for all input test cases. Second principle of testing is "testing is creative and difficult". Yes it requires creativity. It requires extensive domain knowledge. It also requires good testing methodology. It is a procedure to fixing errors. If we find defects in early stages of development then its cost of fixing is less. Cost of fixing of any defect is too higher in later stages. So it's better to go with preventive approach. Testing is risk based process. A risk is a loss associated with an event. Risk can be economical. Suppose I try to test one module of system. I got some defects. I solved defects but due to modification some more defects appear in same module or other modules. So it is risky process. Sometime it increases the cost of testing. Test planning is essential. Test Planning helps to solve many problems in system. Test plan covers points like requirement of testing, test priority, cost of testing, test team, test strategy, test tools etc. These factors effect on testing. Testing must be unbiased. 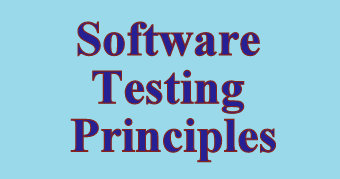 Unbiased testing is essential to objectively test quality of software. If testing is done by same developer who develop it then it may be biased. Developer can be an emotional attachment with its development. Developer who has to test his or her program parts will tend to be too optimistic. Chances of “blindness to their own errors”. So require to testing done by other than developer to make unbiased. It is important principle of testing. Test is done to check system is fulfilling user requirement or not. System must provide expected results. Testing checks that system pre defined specifications achieved or not.